Cronin Racing is looking to make some noise at Dome Valley Raceway’s Season Opener in the Fast Fours class. The Cronin team’s Meltdown dragster driven by Art Cronin received a turbocharger upgrade in the two months since last season’s finale. The 2011 class champion Meltdown ride made big steps late in 2013 getting back towards championship form and this move hopes to put them at the front of the pack. Cronin Racing's Dragster driven by John Cronin is ready for action as well coming off a nice outing at last year's Season Finale. Follow along with NSDN’s coverage this weekend of the Dome Valley Top Fuel Shootout to see how Cronin Racing and the always competitive Fast Fours class fares at the 2014 Season Opener. Click “Read More” to view more pics of the Meltdown upgrades. 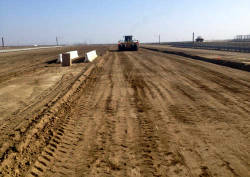 Avenal Sand Drags in Avenal, CA is currently undergoing a massive track surface improvement project for the 2014 race season. The plan is remove the existing water sensitive track surface & replace it with a lighter soil that will be more forgiving while allowing for optimal traction. As you can see in the photos posted, the current track soil is in the process of being moved off. Not only will the soil be different, but the track prep equipment will be different to provide a quicker show & more consistent surface. This is a huge undertaking and the Avenal Sand Drags crew would like to thank all who have donated or chipped in to this project. They will keep us updated here on NSDN as the project continues leading up to the Avenal Sand Drags Opener on April 26-27. Click "Read More" to view photos. Albany Motorsports Park in Albany, OR will be hosting the 2nd Annual Sand Storm event on Aug 15-17. This race will feature some of the best sand drag action in the Northwest. For more information call, (541) 908-3501 or visit the Albany Sand Drags page on Facebook. Click “Read More” to view the full event flyer. Santa Maria Speedway in Santa Maria, CA along with the Sand Outlaws group has put out their 2014 race schedule. These races will be held on March 29, June 14, August 23, and November 29. The events feature bracket racing classes. For more information, call 805-315-2023.